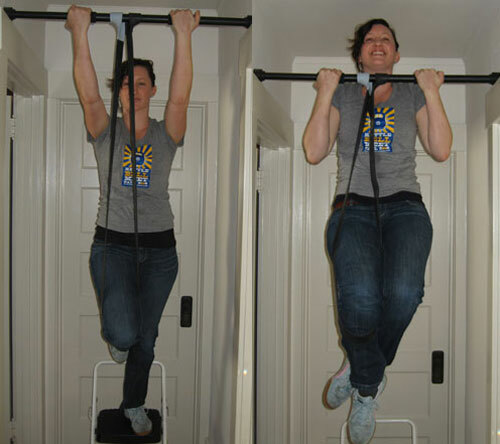 : The basic pullup is done with your hands facing away from you. To width of the grip should be the same as the distance between your elbows when you point your arms directly out to the sides at right angles to your body. The elbows point outward so the are in the same plane as your body. Your arms are nearly straight, but not quite. Your shoulders are down and back and they stay in this position the entire pullup – pretend you are holding a tennis ball between your shoulder blades. Dont relax into a dead-hang at the bottom and let your shoulder come up to your ears. OK, now that we have the basic starting position, slowly pull up on a two second count. starting position: The elbows point forward and slightly outward, just do what seems the most comfortable. Your arms are nearly straight, but not quite. In this bottom position, dont go into a relaxed dead-hang! Keep the arms bent slightly which keeps your lats loaded. 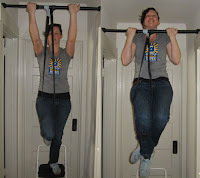 Your shoulders are down and back and they stay in this position the entire pullup, dont relax at the bottom and let your shoulder come up to your ears. OK, now that we have the basic starting position, slowly pull up on a two second count. starting position: right arm locked out, left leg locked out, right knee bent and resting on cushion, head in comfortable position. You arm is straight but not locked. Your shoulders are held down and back and they stay in this position the entire exercise, you chest should be thrust out. In this down position, do not let the weight pull your shoulder toward the floor – it should remain back with your chest thrust out. Slowly over a 2 second count pull the weight up to your hip while keeping your elbow close to your body and your shoulder stationary. FEEL this in your lat, flex your lat while you do this. ending position: Elbow is about 90 degrees at the top of this motion. Note the rest of the body has not moved at all. Now slowly lower the weight making sure to keep the shoulder in the same location keeping your lat flexed the whole way down. starting position: The arms are almost straight but not locked. Best is to use an underhand grip, that is, with your palms facing forward. The shoulders are back and down with your chest thrust out for the entire exercise, dont roll your shoulders forward and dont let the hanging weight pull your shoulders downward. Your abs are flexed hard turning your torso into a pillar of steel to support your spine. Your back is in the neutral position, not arched like a hissing cat and not sagging like a camel. Keep your shoulders down and back with your chest thrust out during the whole exercise – pretend you are holding a tennis ball between your shoulder blades. The bar is not hanging but forced to rub lightly along the legs the whole range of motion. Now slowly start pulling the weight up toward your hips. Keep your abs flexed tight to support your lower back and protect it from injury. ending position: Keep pulling the bar up toward your hips in a slow controlled motion over a two second count until it lightly touches your abs. Make sure that your back, shoulders, and legs are all completely motionless. If you cant do this then you are useing too much weight. Now slowly lower the bar trying to keep it under your hips. what a great blog. really so much appreciable blog. because pics are so much understandable. I wanted to say you thank you for this awesome posting. like it so much. looking forward to see more.